What do you get when you cross a yo-yo with juggling balls? The answer is Astrojax! 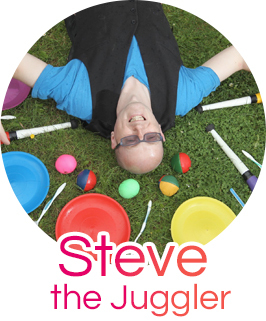 This is a much more recent toy compared to the diabolo and juggling balls which have been around for many hundreds of years. New tricks are being invented all the time! 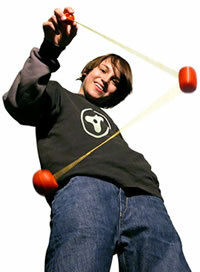 Astrojax consists of 3 weighted balls attached by a piece of string with the middle ball freely moving. The construction of an actual Astrojax is however fairly complex as each ball has a precision machined metal weight in order to provide maximum performance and smooth action whilst playing. Never play with astrojax near people or objects as these balls can really hurt if they hit you! Vertical Orbit:Hold an end ball in each hand. 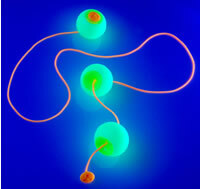 Drop one ball and smoothly tug the ball in your hand rhythmically up and down to continue the motion and keep going! Horizontal Orbit:Use soft circular horizontal movements of the hand which contains the ball. There are 3 types of Astrojax trick that you may want to specialise in. I offer a quick description and some hints, but to find out more and to see excellent video clips, then visit www.astrojax.com !! Most Astrojax products sold in my Jugglingworld store come with CD-ROM’s full of trick video clip tutorials. Juggling Tug a bit harder on the balls so the far one comes up to hand height. Every time a ball comes up to this height, let go of the ball in your hand and grab that one! The Guiness World Record (last time I checked) was 3,208 consecutive catches by Maximilion Leidolf of Germany. This took him 24mins and 52secs on 12 February 2000! Rebound Tricks Try bouncing a ball off the floor, or kicking a ball lightly. Keep the pattern looking smooth. String Tricks Wrapping the astrojax around various body parts. You may be able to let go of the string temporarily and catch it again once it has swung round the finger, leg etc. Astrojax was invented by the American physicist Larry Shaw who discovered the basic principles while still at Graduate School. He was very interested and excited at all the complex patterns that this simple arrangement created and so he took time to work on the idea. It took nearly 2 years and hundreds of prototypes before Larry Shaw had his idea patented. Astrojax is a fascinating new toy illustrating a wide variety of basic science principles. Rotational Dynamics: A metal weight concentrates the mass at the centre of the middle ball. This allows the middle ball to spin rapidly. An ice skater uses this principle when he brings in his arms during a twirl to spin faster. Planetary/Orbital Motion:During vertical orbits the outer ball orbits around the middle ball. During horizontal orbits, both balls orbit in perfect circles. Our earth orbits around the sun and our moon orbits around the earth in ellipses which are not quite circular, but pretty close! Skyscraper Do a few orbits,then pull on the ball your holding harder than usual to perform a big orbit. Around the World Build up a rhythm,then pull the ball your holding in a circular direction.There are many versions of this trick.The possibilities are endless! Butterfly Do some orbits,then pull the ball your holding left and right,to perform the trick.This is a extremely easy,yet one of the most beautiful tricks ever. Make sure you have plenty of space all around you, so that you won’t knock any items over. Astrojax is best practiced outdoors, but over a soft grassy surface in case you drop them!